After gutting rotten interior discovered what iron brackets and screws do to aluminum ribs. Shiny due to wire cleaning. 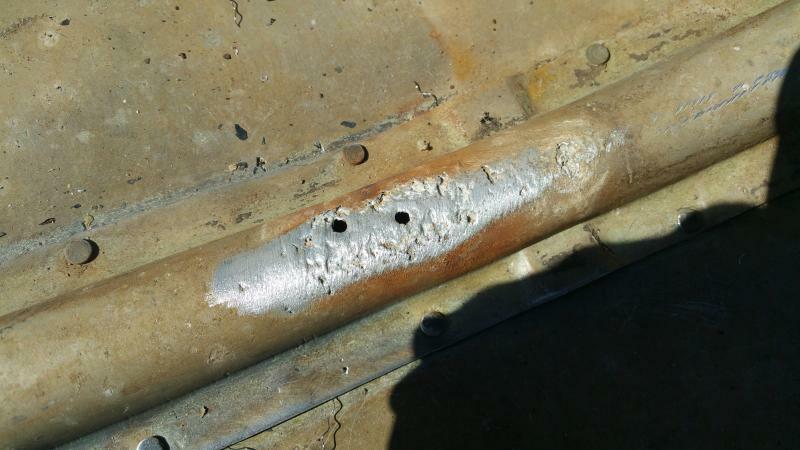 question, would the aluminum brazing rods work to fix this corrosion? There are three kinds of people, those that count and them that don't. I think that they would. FYI, just had a similar effect on a friend's boat and we cleaned the area, washed w/ vinegar, dried, primed w/ self-etching zinc chromate rattle can spray paint, and then topped with G-Flex flexible epoxy. As good as new (within reason). Epoxy products need to be painted to protect them from UV exposure. The issue with the brazing rods is if you over heat the aluminum you will cause more damage to the rib. If you want to use the brazing rods do a lot of practice on scrap aluminum long before you take a torch to your boat. What is the hives recommendation on type of screws? Last edited by pbw on 23 Sep 2016, 10:31, edited 1 time in total. ????? What is the hives recommend on type of screws? ????? Spellchecker must have done a number on you? Nope just one word...this is one big beehive sir. Uhhhhh ... tin boats ... don't use a screw if you can use an aluminum solid rivet (preference) or closed-end blind or 'pop' rivet (second ... provided the strength/shear requirements are achieved). If not, through-bolting is your best strength, but INSULATE the SS fastener from the aluminum by using Tef-Gel seal or putting adhesive-lined heatshrink on the body of the bolt and nylon or other non-metallic washers under the head and nut of the fastener. To do so otherwise it to create an environment for galvanic corrosion where the more noble stainless steel will cause an electrolytic reaction with the tin boat ... to where it will corrode away. This reaction is worse on saltwater boats as saltwater is an ideal electrolyte! What people said above - but give it an acid wash, then neutralize with ammonia / baking soda if you intend to prime / paint.